This is my favorite magic book. The reason for this is that it was a ground breaking book at the time it appeared and its contents is excellent. It was the first magic book which had photos instead of drawings or engravings throughout. And the contents is fantastic. It is one of the few books with a large chapter on chapeaugraphy. Add to this great chapters on shadowgraphy, plate spinning and paper folding. A large part is devoted to card magic, magic with coins, balls, and handkerchiefs, and much much more. If I would have to select one book this would be it. It is a book not many people know about. But you will not be disappointed. 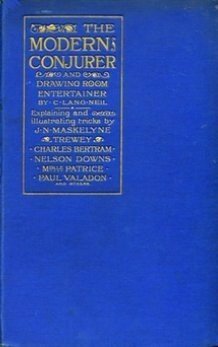 "The Modern Conjurer," by C. Lang Neil, explaining the tricks of such masters of conjuring as Maskelyne, Trewey, Bertram, Patrice, Kennard, and others is published by the J. B. Lippincott Company. Four hundred pictures from photographs of actual tricks are included in the book. The same firm publishes "Romance of Modern Invention," and account of airships, submarines, sun-motors, dirigible torpedoes, mono railways, telautographs, together with many anecdotes, by Archibald Williams, illustrated. From the Notes and News section of the "New York Times", Nov. 22, 1902. 1st edition, 1902, Lippincott; reprint, 1937, David Kemp & Company, New York; 386 pages.